Round about 2008 my company put together a package we call the Cloud Five Pack. Basically, it's a bundle of up to five licenses for a series services that we believe provide "All the technology you need in a small business." We sell the bundle along with managed services. It goes over VERY well with 5-, 10-, and 15-user offices. At the time I think we had five full time technicians and we moved fifteen of our clients to that service in one month! Most of those services are cloud-based (email, web, spam filtering, remote management, storage, etc.). But we find that it's still handy to have a little server onsite for very specific purposes. We use the local server for security, logons, backup, and the occasional line of business application. We call it "Server Lite" and build it on technology we own. That is to say, we provide a Lite server to the client for a monthly service payment. My company owns the server and the operating system. Note: I incorrectly stated in this video that a CD/DVD drive is standard. It is not. This machine is awesome. Fits nicely on any shelf and works perfectly headless. Between ILO, RDP, and the LogicNow remote access, I never have trouble getting to the server! For more information on the Cloud Five Pack, see http://www.cloud5pack.com/. Gotta say - this machine is WAY more powerful than the machines we used to load up with Small Business Server, especially back in the days of 32 bit processing and limited RAM. You could stress this a lot more than we do, but with the light duty we give them, we expect them to perform perfectly for 3-4 years. We used to sell bigger servers, such as ML350 or DL380 loaded with Windows Server Standard, upgraded RAID controllers, and all the goodies. Those machines ran $5,000-$7,000 with software - plus labor. And while those were great, profitable projects, they were hard on the client. Eventually it became clear that the right thing for the client was to move to mostly cloud services and away from capital expenditures. Our cloud five pack does that - and the HP MicroServer allows us to do it with rock solid dependability. Will be posted next week. Stay tuned. 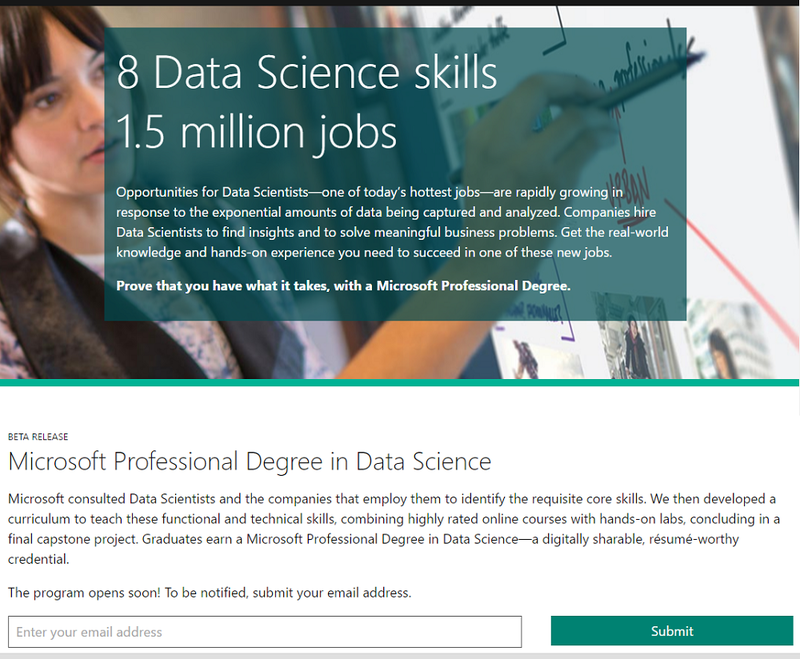 Not too long ago, I signed up for the Microsoft curriculum on big data and analytics. 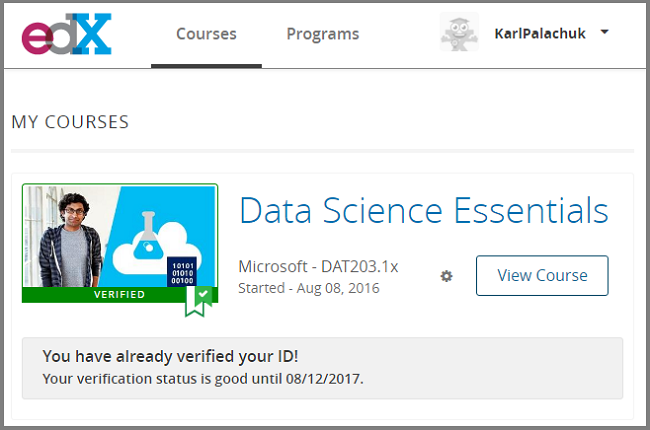 The first course in the series is Data Science Essentials. See the original blog post here. The course has six modules plus a final exam. There are mini-exams at the end of each module that, together, account for 50% of the grade for the course. Module One is a basic introduction. What is Big Data, what can you do with it, etc. Module Two is real stuff. It's basically a quick intro to probability statistics and various kinds of variables. I took lots of statistics in graduate school and occasionally read up on statistics just to keep tuned up. Given that, I think it would be hard to understand everything in Module Two if I didn't already have a good background in this stuff. The very good news is that you can download a transcript of the video presentation. There is also a PDF white paper you can download that does a good job of summarizing the material. The handouts and downloads are less than 15 pages total. So while it's dense, you can definitely get through it if you just sit down and read. The lab for this module consists of setting up a free account on Azure to access the databases and examples, and installing the software needed to run the R programs. There's a bit of coding involved, but no real explanation of the coding. That's okay for now. Later in the course I assume we learn enough to do some code cleanup. I assume this gets harder. But it's still an intro course. So I'm hoping I can finish before I head off to Colombia at the end of the month. Big Data Education . . . Microsoft Style. I did a "video interview" with Amy Babinchak a couple weeks ago. We fished around for various technical solutions before we settled on recording a Skype call via Camtasia. The first time we did it, the audio was messed up. Google hangouts may have worked, but it didn't work for us. I have a GotoMeeting/GotoWebinar account that is great . . . but doesn't record web cams for two people. We are now well into the 21st Century. You would think there would be an easier answer. Last week I appeared on Lisa Hendrickson's Office 365 podcast ( see http://blog.smallbizthoughts.com/2016/08/call-that-girl-with-lisa-hendrickson-on.html ). She uses a tool called Zoom (zoom.us). For only $14.99/month, you can have several people on a call and easily record them. I loved it. I am going to start up a new podcast/videocast series. So I was very happy to find this tool. I used it to record a quick chat with my brother Manuel (see yesterday's blog post). The recording was super easy. If you are using a "producer" you can hide one of the attendees altogether and assign the record function to that person. For an extra fee you can have sessions recorded in the cloud. I also like the layout. Skype isn't bad, but having to engage another tool to record the screen and hope it's working is not ideal. Google Hangouts will record a meeting, but I find the screen jumping-around to be very annoying. With a nice wide screen monitor, the recording is also well formatted for branding. In the example here, I just threw in a banner for the Great Little Seminar site and had room at the bottom for call-outs. The recording is automatically formatted in both MP4 and M4A. These can be edited and combined in Camtasia, Adobe Premiere, Microsoft Movie Maker, or any other program that will load these formats. Overall, I like the Zoom.us tool very much. Lisa's been using it for years and swears by it. Check it out if you're producing video meetings, podcasts, etc. I think you'll be impressed! Also stay tuned for the new series right here and at SMB Community Podcast - www.smbcommunitypodcast.com. If you run a service business of any kind then you know that time is the most important thing in your business. It's what you buy from employees and sell to clients. It's the most expensive thing you buy every month, and it's the most expensive thing you sell on a regular basis. As my brother Manuel says, "Time is your widget." You have to keep track of it very carefully. 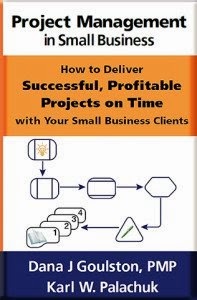 Once you track time accurately, you can tell with certainty whether your projects are profitable, your contracts are profitable, and your technicians are profitable. We had a quick chat yesterday about the next big 5-week course offered at Great Little Seminar. 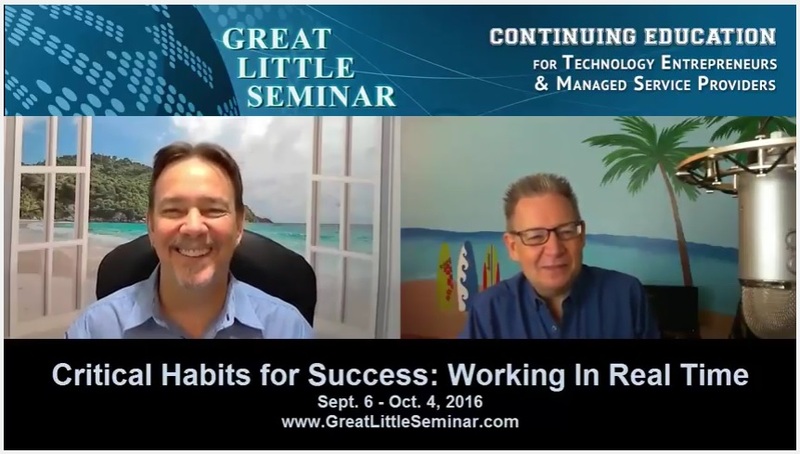 The course is called Critical Habits of Success - Working in Real Time. There are a few habits that can virtually guarantee higher profits for your business. Working in "real time" is certainly one of them. It will also dramatically lower the stress within your organization. In this very practical course, coach Manuel Palachuk will show you how to get everyone in your company working in real time. Every CRM, PSA, and ticketing system out here wants to supply you with great reports on your bill-ability and your efficiency but not one of them can do it unless everyone is working and tracing time in real-time. 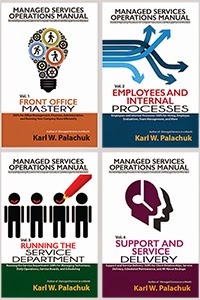 Tap into the wisdom of the author who has turned service delivery systems around for many companies and who can help you do the same for yourself. Even if you are the only one who creates billable time in your company you likely need some coaching on how to make the transition and here it is. What it means to work in "real time"
My second server documentation video is posted. I posted the first video last week - HERE. As you can see, a big piece of "documentation" consists of keeping track of what you're doing. When your computer arrives, you already have a pouch for holding documentation. Now you add to that the collection of paperwork and software that ships with the server. This includes the packing slip, which has the serial number for your server. We also open the machine to inspect the inside. And we're going to grab a label-maker and label the physical drives. It's handy to know which slot they're going to live in - and the date they were placed into service. 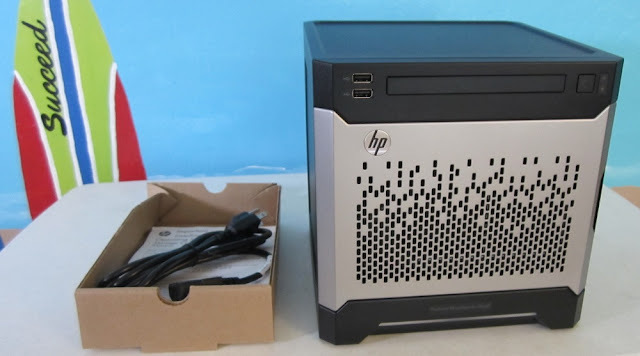 Next week I am posting a review of the HP MicroServer. The week after, I'll have a video on documenting the actual installation and configuration of the server. We offer an add-on to this package that provides a server on site (which we own). It is used to provide local security, Active Directory, and provide very light file serving. 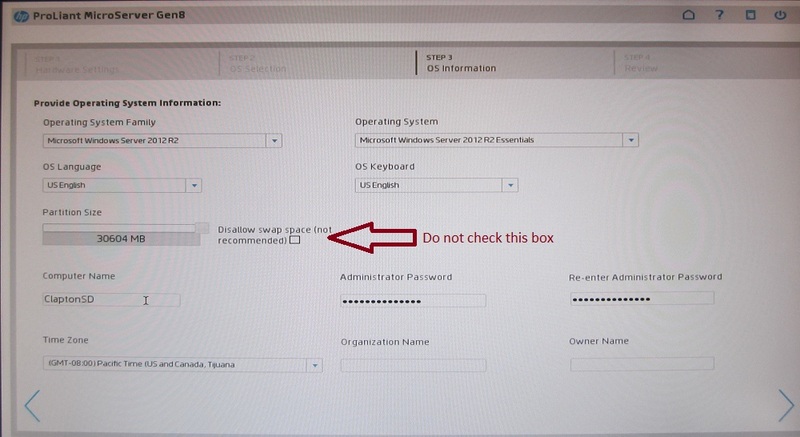 For example, if the client has an on-site installation of QuickBooks or Business Works, that lives on this server. All other company files are in the cloud with a mapped drive. We refer to this on-site server as "server lite" to clients. We want to make sure it is NOT in the league with Small Business Server. It will not serve up in-house Exchange, SQL, web, SharePoint, CRM, and file sharing. The reason I gave all that background is because most of my readers are nerds. We nerds have a tendency to ask questions like, "What about capacity planning, stress testing, and loading up line-of-business applications?" This server is intended to be just right - powerful enough and extremely reliable - for the specific jobs listed above. It is not intended to replace six virtual servers. 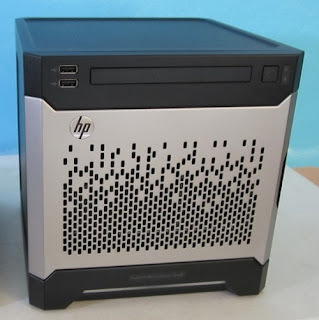 I love to run Microsoft Server 2012 Essentials on the HP MicroServer. This is truly a killer combination. - A way for me to get on the client's network without disturbing anyone. So I can test some things and access internal resources. For example, if we need to make updates to the network scanner, I can access that from the server but not the Internet. We also set up firewalls so they can only configured from the internal network. The server I bought comes configured with 8 GB RAM and four 1-TB hard drives. Because it has an on-board RAID controller, my plan was to create two RAID-1 mirrored drives. One is for the operating system and "tech" files. The other is for company data and backups. The client has about 100GB of "live" data and another 60GB of old data. All of that lives in the cloud. So we back it up by bringing a copy back down from the cloud to this server. The client doesn't realize it, but their on-site server is their backup for all hosted services. I did set up the O.S. as expected. It takes up almost exactly 24 GB of disc space. That includes a 2GB swap file, created by Windows. That seems low for a system with 8 GB RAM, but it's likely to grow over time. That's when I got to thinking about booting from SD. I knew this option existed, but we've never done it before. So I decided to give it a try. If I'm unhappy with it for any reason, I can just use the drives I've already set up. I won't go into too much detail on the build once the Microsoft Installation starts. Once the file copy starts, the process is identical. Loading from USB media to SD operating system is only a little faster than USB to spinning disc. I assume this is due to the process of un-compressing files and then copying them. SD Technology for the Operating System??? I probably had the same reservations as everyone else about the SD technology. In addition to the considerations for speed, and the limited size, I was also worried that the limited number of reads/writes would severely limit the lifetime of the SD card. HP has a great (short) document on this subject. In addition to covering the simple process of setting up the hardware, this doc addresses why SD cards are a legitimate medium for this and how to configure: http://h20195.www2.hpe.com/V2/getpdf.aspx/4AA4-9872ENW.pdf?ver=1.0. That document's a quick read and well worth the time since it provides a really good understanding of SD technology. Basically, the message is: You want SLC - Single Layer Cell - technology for performance and endurance. But you want MLC - Multi-Layer Cell - technology for density and cost effectiveness. So of course HP came up with a combo they call SMLC technology. The HP cards sold for this application top out at 32GB. I wanted more (of course), so I ordered a Kingston MicroSD card, class 10 for speed, and SDXC for high capacity. Of course that document told me that the non-HP product wouldn't work, but they say that about hard drives as well. So I thought I'd give it a try. Result: The Intelligent Provisioning option for MicroSD simply doesn't show up. It's not grayed out. It's gone. Lesson One: You must use the HP MicroSD card. OK, lesson learned. 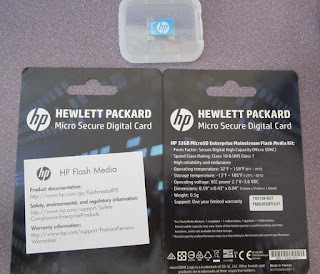 I ordered the HP branded 32GB MicroSD "kit." It's official title is 32GB microSDHC Enterprise Mainstream Flash Media Kit and the part number is 700139-B21. It was about $130 from my distributor, including shipping. The stats on this tiny little card are very impressive. Projected block writes = 13,107,200,000. That's 13 with a B for billion. Includes very impressive Error Correcting Code (ECC) and you can monitor wear via the HP Integrated Lights Out (ILO) card. That means you can log into the server via ILO and get underneath the operating system to verify wear on the SD card. In addition to the obvious benefits such as cooling and space, SD-based operating system drives are very fast. That's not the old SD reputation. But the new XC class 10 cards are significantly faster than any spinning disc. Not sure how they compare to SSD cards on a SATA interface. As a rule, HP estimates that the O.S. drive will experience about 70% reads vs. 30% writes during normal operations. And since reading will be significantly faster than writing, performance should be excellent. The biggest concern I had was the Windows Swap file on SD. My plan was to disable it and put a Swap file on the data drive. The document noted above says that you can basically disable swapping altogether if you have a solid state O.S. drive and enough system RAM. Again, remember that most of this is just for fun since the server will have essentially near-zero load all the time. 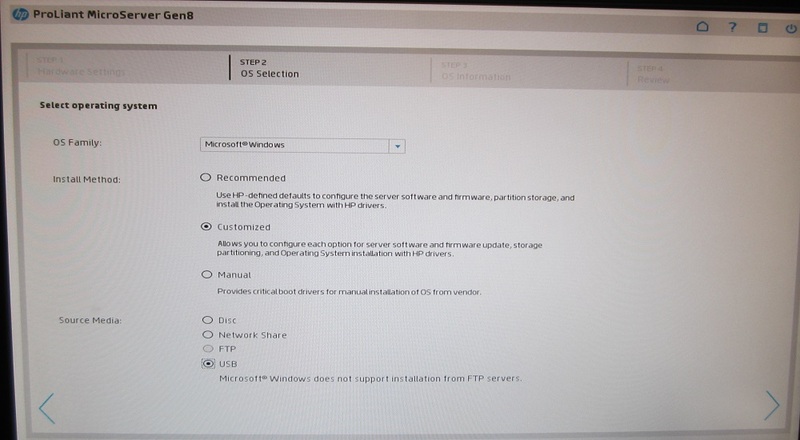 First, let me note that I did a full, normal, regular Server 2012 R2 Essentials setup on the mirrored SATA drives. Worked perfectly. Textbook. Exactly as expected. So even though I've done this install several times, I had a fresh new experience on fresh new hardware. The installation to SD was not as easy and trouble-free. I added the HP branded 32 GB SD card even though it seems really small. I removed all hard drives. I booted up the machine and hit F10 to run the HP Intelligent Provisioning. See screen shots below. There's not much to choose from on the first screen. I do note that the MicroSD card is selected as the only option for installing the operating system. Of course there were no hard drives present. On the second screen, OS Selection, I started with the recommended selection, but on the next screen it would not install to the SD card because it wasn't large enough. So I went back. Selected "Customized" install and then was able to configure the third screen. On the third screen, OS Information, you need to pick the specific operating system you want to install. I picked Server Essentials. When I checked the box to have no swap file, the size indicator of the card went to zero and I could not install the O.S. So I went back and refreshed the page. When I did not check the box, I got a warning the the partition was below the 180GB recommended for the volume. I said to continue and it did. After lots of file loading and lights flashing, I was asked for the product key and then it booted into Windows. I noted that the O.S. was taking up about 21 out of 29.5 GB usable on the MicroSD card. That's less than on the spinning hard drives. So far everything had gone well. But the Server Essentials "interview" configuration stopped at 25%. I retried and it stopped at 29%. I reviewed the requirements for Server Essentials. Among other things I tried to re-run the configuration after disabling the second NIC and installing one of the 1TB drives so the system could store stuff there if need be. Of course there's a reboot after each of these. Ran Server Manager. It was not able to add any roles or features. I verified that all "automatic" services were started. I reviewed the few logs that were created (setupact.log, dism.log, and smh_installer.log). No errors. No help. I had to create the \Windows\NTDS directory manually, but I was able to get the domain created. I verified that DNS was running, and machine was pointing to itself for DNS. After a reboot, I was able to run Server Manager and add several roles. BUT the Server Essentials Configuration keeps running . . . and stopping at 29%! At this point I did some research on Technet and the never-ending Microsoft boards where 99.9% of all discussion amounts to, "I'm having the same problem. Hasn't anyone fixed this yet?" I have installed Server Essentials many times and never seen this error. So I tried the few suggestions that were given over and over. Some suggestions worked for some people, but not for others. The big recommendation from Microsoft folks is to add the user ServerAdmin$ to the "Log on as a Service" group policy. But like many people, this user did not exist for me. One person said that all he did was double the RAM and double the hard disk space and it worked for him. That led me to believe that we really have a resource issue, not a permissions issue. Given my problem with Roles and Features, and particularly with the Server Essentials Configuration program, I decided to attack the problem from a different angle. First, I'll install regular Server 2012 R2. No wizards involved. [ Note: The license for Server Standard is more expensive than for Server Essentials. But Server Standard is a VERY light installation with no roles assigned. One of the roles available is the Essentials Role. It allows all the cool management and features of Server Essentials without the licensing limitations. I'll skip through some troubleshooting here to bring you the answer that worked. I physically removed the MicroSD card, put it in another machine, and formatted it. Then I put it back in the MicroServer and ran Intelligent Provisioning. I added an empty 1TB drive even though I was installing the OS to the MicroSD. This time, the same screen I had before warned me that the 30GB partition was smaller than the 40GB recommended (last time it said 180GB recommended). Again, the total setup time was about an hour and forty-five minutes before I got a logon screen. At this point, I had 20.7GB free on the "C" drive out of 29.5. That means a mere 8.8 GB were used for the operating system. Yay. The system had configured itself to have no swap file and no memory dump on blue screen. Now I had a working version of Server 2012 R2 Standard. Server Manager ran fine. I added the DNS Service without any problems. Added the Server Essentials role without any problems. When the Server Essentials Configuration came up, it stopped at 29%. So while I had a much lighter installation, I had the same issues. At this point, I had no ServerAdmin$ user to add to the "Log on as a Service" policy. I also had no domain and the machine name was a random self-assigned name. So the interview hadn't gotten to the rename scripts yet. But since I had the Server Manager available and working, I added AD Services and promoted the server to a Domain Controller. I had to create a forest and local domain. After a reboot, I had the new machine name, the new domain, and no errors in Server Manager. The Server Essential Configuration ran automatically because it had not finished. This time it zipped passed 29% and finished very quickly. The system was now running Server 2012 R2 Standard in Server Essentials Role. Lesson Two: There appears to be an issue with lack of resources (primarily hard drive space) and a smooth installation of Server Essentials to the MicroSD card. You can bootstrap the installation by loading the OS, loading DNS, adding the AD/DS role, and then completing the Server Essentials Configuration. 1. Intelligent Provisioning. See Screen shots above. 2. Setup works fine. Server Essentials Configuration runs automatically and fails at 29%. 3. Added the DNS Role in Server Manager. Verified configuration. 4. Added Directory Services Role. Reboot. 5. Promoted the Server to Domain Controller. Renamed as needed. Reboot. 6. Ran Server Essentials Configuration. Successful. Side note: During Directory Services setup, I created the three NTDS folders on the "D" drive (SATA) rather than let them be created on the MicroSD card ("C"). Overall, with 1.5-2 hour installations and lots of troubleshooting, the whole adventure took about twelve hours. That's a BIG example of why I use and recommend a Troubleshooting and Repair Log with every server build. Basically, you should keep really good notes and refer back to them. The six successful steps above took about 2.5 hours total. THAT's what I want to replicate the next time I do this - not the 12 hours of troubleshooting and trial-and-error. That also gives me a very solid estimate of how much time I need to quote in order to be/stay profitable. As you can imagine, I'm concerned about overall performance. As an interactive user on the server, it performs very well. Even connecting through RDP is nice and fast. Boot time is almost identical between SATA RAID-1 drives and MicroSD card. A few seconds is all the speed you get. But it's a pretty fast bootup anyway. I ran a few performance tests on both the SATA-based installation and the Micro-SD installation. Copying about 7GB of files from one point to another on the "D" drive (where data would be stored), the MicroSD installation was a great performer. Both installations finished the chore in about a minute, although the MicroSD was a bit faster. More importantly, the SD installation used an average of five percent processor time during the file copy operation, with a few peaks at 30%. The SATA installation used a minimum of 20% processor and had a few peaks in the 80-95% range. Measuring Average Disk seconds per Transfer, the the SD installation was in the range of 0-5 one-hundredths of a second. The SATA installation was in the range of 5-70 one-hundreds of a second, with an average in the 20's. Disk Queue Length for the SD installation was generally around 2-3 with eight peaks around 9-10 and eight troughs at zero. The SATA installation had an average Disk Queue Length of four with seven peaks around 9-10 and four troughs at one. It only reached zero at the end of the operation. Both systems had very consist measures of total Available MB of Memory at about 5,000 (5GB). This was a nearly flat line for the SD installation and had one small dip in the SATA installation when the Disk Queue was high, as you would expect. Of course I installed my standard LogicNow MAX RMM agent on the server. So it will be interesting to see how it compares to other servers in my dashboard. Bottom Line: I am cautiously optimistic about this installation. I will be monitoring it very closely. And I've saved the two-drive mirror with Server Essentials installed, so I can literally just plug that in and go if need be. Stay Tuned. I'm going to write another blog post about using the ILO (Integrated Lights Out) card to monitor the system performance and the SD card read/write history. If you haven't used an ILO card to monitor servers before, I think you'll find it interesting. Sorry this is technical and off-topic for the business folks. But it was a fun project. Big Data is coming. It's coming fast. And there's a shortage of technical people who understand it and can turn it into usable information. And since I don't want to get bored, I decided to dive in. The truth is, I have several years of graduate school statistics under my belt. In fact, I met my wife of 20 years at what we call "Nerd Summer School." It's the University of Michigan Inter-University Consortium for Political and Social Research (ICPSR) summer program. I was helping to run the program and she was a student . . . about 30 years ago. Anyway, I have been training myself on Big Data and modern data analysis techniques. In fact, I recently finished writing a white paper on Big Data for LogicNow. So keep an eye out for that. For FAQs on the Data Science program, go to https://academy.microsoft.com/en-US/faq/. Right now the only thing you can officially do toward the degree is to sign up and get on their list. BUT you can also start taking the classes and ask for them to be applied to the degree when you're finished with each one. That's what I've done. I just started the first course over at edX - See https://www.edx.org/. It's supposed to last 4-5 weeks but I'm going to Colombia in three weeks, so my plan is to cram through this one since it's an orientation class. So far, there are PowerPoints and recorded video lectures. You can download the PPTX files and the lecture transcripts. That's pretty nice. I paid $49 for the class with credits. You can audit the course for free, I believe. But of course you won't get a degree at the end. The primary tool family used for Big Data analysis is call Hadoop. The most common language used to perform the analysis is called R.
Of course I'm a book kind of guy, so I also decided to get a book on learning R. I went to Amazon and Searched for Learning R . I bought the book from O'Reilly called Learning R.
Then I remembered that I'd seen some Hadoop and R references my Microsoft Action Pack. Sure enough. The downloads include R Server for Hadoop, R Server for Linux, and R Server for Teradata DB. All of these are on-premise installations. Since I already know we'll be using R in the courses I'm taking, I'll plan to download these once I have some idea which I need. The intro course already promises to help me get set up with using R in the Windows Azure platform. Since I have an Azure account already, that should be easy. The best way to get ahead and stay ahead in the world of technology is continuous education. Right now there isn't a lot of attention being paid to Big Data in small business. But that will change. LogicNow's LogicCards are a great (and powerful) example of what can be done with Big Data in small business. And while none of the other RMM vendors have made serious attempts to match them, they will have to eventually. If it's been a long time since you tackled a new technology - especially one that looks difficult - I think you'll find the Microsoft program very manageable. It's one class at a time. If you don't pass you can take it again. And at $49 per course, the price is too cheap not to try. You may also find yourself tempted out of the world of SMB. If it's true that there will be 1.5 million jobs with no takers in the next few years, we may all get swept into the Big Data world. I plan to blog about this from time to time, so you're welcome to follow along. But I'd much rather you joined me. Then we can compare notes on Facebook, LinkedIn, and at live conferences over the next year. The next several videos I'm going to post are related to server documentation. The first video in the series talks about what you can do before the equipment arrives. What Do You Need To Document? That's a great question. The answer comes from looking ahead and trying to figure out what you might want to know in the future. For example, I have a basic Server Spec Sheet in my Network Documentation Workbook that lists things like processor, RAM, number of hard drives, address of the NICs, etc. Think about what you start looking at when you walk into a prospect's office and look at their server. What do you care about? What are you going to look for? That's what you need to document. You do not need to document all the patches that have been applied, the DLL versions, or the rev on the graphic card bios. All of that is irrelevant to backing up the system, running remote monitoring, and doing regular maintenance. All those things are might be useful in some one-in-a-million troubleshooting job are thing you do NOT need to document. ... Having said all that . . .
Once you've decided on a server, received payment, and ordered it, you have a LOT of specs right in front of you. Print out the server description from the distributor. 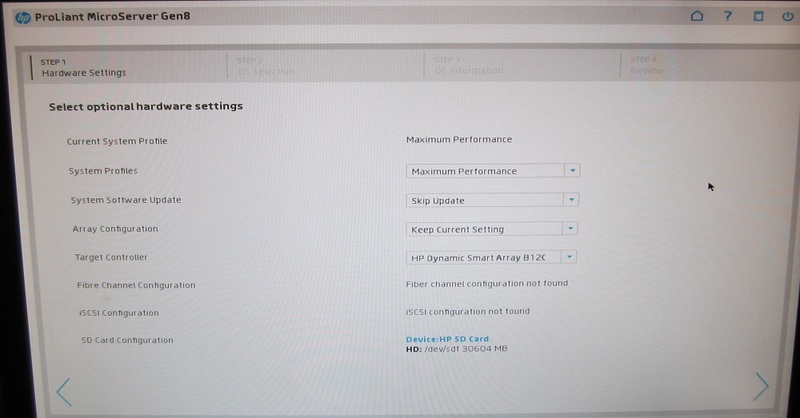 If you order something like the HP Smart Buys, you'll have a system with lots of details. If you have to configure to specs, or add all the pieces separately, then the details will be displayed as a series of line items. Either way, you'll have a great piece of server documentation there. In fact, it will be filled with a lot more information than you need. But it will have the most important information. Pretty much the only things you won't have at checkout will be the serial number of the machine you're going to receive and some details for accessing customize components such as the Integrated Lights Out MAC address, username, and password. We buy 1" manila folder pouches for each piece of equipment we sell. These are easy to organize. They also make it very easy to have all the related information, paperwork, and software at your fingertips when you're building the server or onsite at a client office. Since you know the client's name and the scheme for naming machines, you can start now. Assign a name and IP address to the new server. Label that folder with the server name (the one shown here will be named Clapton). I made three labels: One for the folder, one for the machine, and one for the documentation spec sheet. You might also print out a Network Spec form because it has a place specifically for the local admin password, IP addresses, and other information that's not part of the distributor's machine description. Next week we'll talk about executing the New Server Checklist. That's your tick-by-tick list of procedures for everything from opening the box to delivering it to the client office. Starting tomorrow, I'm going to post a series of Friday videos on server setup and documentation - specifically with regard to the Cloud Five Pack offering that I've been offering since 2008. These will be on my YouTube Channel - www.youtube.com/smallbizthoughts. And of course I'll add notes here on the blog. 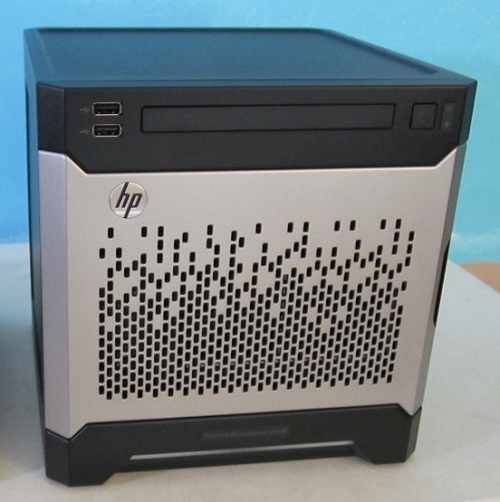 In addition to that, I'm playing with the latest (Gen8) HP Microserver before I put it in service at a client's office. Note: I do not have anything to "sell" to computer consultants, VARs, or MSPs with regard to my Cloud Five Pack. I am merely using it as a tool to show you how you can make a LOT of money with cloud services. My Cloud Five Pack is a series of bundled services that are sold for a low monthly fee. One big piece of that bundle is a strategy for success. The goal is to find clients who want 100% reliability with a combination of cloud services and onsite hardware. The first video (tomorrow) will cover a bit of documentation you can start before you even have the server. Next week we'll look at labeling equipment and keeping track of the software and documentation that arrives with the server. On the 26th I'll give a product review for my favorite server: The HP MicroServer, Gen8. This server is perfect because it's right-sized for a cloud offering. Generally speaking, I want to have active directory onsite. And I want to control DNS through a server onsite. If files are stored locally, then all this machine has to do it authenticate logons and serve up files. If files are stored in the cloud, then we're going to use the server as the "backup" and copy those files down every night (when no one's around). We don't tell the client we're using Windows Server Essentials for this - because they don't care! It just works. That they care about. To clients we refer to the entire setup as Server Lite. We throw an RMM agent (LogicNow) on the machine so it gets patches and updates, plus anti-virus. Other than that, we do very minimal maintenance on these machines because (again) they just work. More videos to follow, of course, on working through the server build checklist and documenting the important stuff after it's in place. As a brief detour, I'm going to set up this machine with the operating system on a 128 GB Micro-SD card. I'm not sure I'll leave it like that, but I want to do it because I haven't before. I want to see how acceptable the installation and performance is. I promised Richard Tubb I'd do a completely separate blog about that. I connected with Lisa Hendrickson from Call That Girl Technology Support. Lisa runs the Office 365 Podcast and had me on her 60th episode. But we did cover a lot of territory, including some strategies for making money with Office 365. Hint: trying to sell it the way Microsoft wants you to is NOT the answer. One of the great fallacies that new service providers fall into is the belief that they have to offer payment terms to their clients. I did it when I first started. Then I gradually found that lots of people owed me money. So I changed my policies. We had always asked for payment on the first of the month. Eventually we switched to credit card only on the first of the month. Almost zero push-back. For clients who didn't want to do that, our terms are three months in advance by check. Zero push-back. Next we asked to be prepaid for all hardware and software. After all, why should we be out of pocket for tens of thousands of dollars of someone else's equipment? Zero push-back. As for projects, we asked for at least 50% up front and milestone payments for larger projects. No push-back. Finally, we asked for people to pre-pay blocks of time so that weekly minor invoices go away and we just chip away at prepaid time. Zero push-back. The point is: These are very reasonable terms. And they can make a huge difference with your cash flow. My latest SOP video talks about some of the specifics of setting up "terms" and making your exposure as small as possible. My 12th Annual Fall Seminar will be a "post day" show this year - attached to SMB TechFest in Anaheim. I worked with Dave Seibert to create a true killer combo. SMB TechFest is October 20-21st in Anaheim. The show concludes with a joint lunch sponsored by SMB TechFest and Small Biz Thoughts. Then my seminar kicks off at 1:00 PM. SMB TechFest is $99 - But you can get in FREE as my guest by visiting http://www.smbtechfest.com/karl. Now, as for my event: Check out the web site. Join us in Southern California – or get all the material recorded after the event! 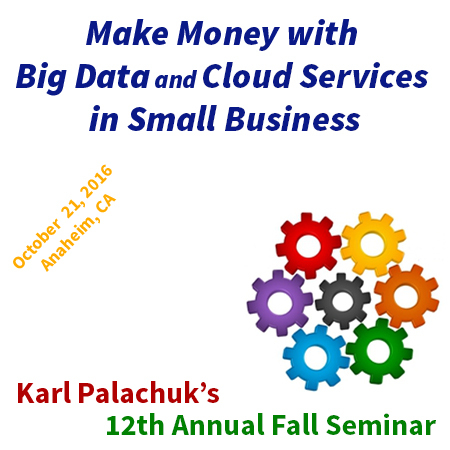 This year’s Fall Seminar is on Making Money with Big Data and Cloud Services in Small Business. It will be 100% practical and up to date. This year’s Fall Seminar will include workshop” sessions to help you get started making money in the hottest new trends in technology today. This is a VERY practical seminar. You’ll be able to apply this information right away when you get back to the office on Monday. Big Data is literally the hottest topic in I.T. Learn what it is, how it affects you, and how you can make money with Big Data. You might be surprised at the new services you can offer. Cloud Services are now very mature. Karl has been teaching about cloud services for more than eight years. Learn how to create very profitable cloud service offerings that fit perfectly with the small business environment you’ve been servicing for years. I guarantee you’ve never see a seminar like this in the Small Business consulting community! — at no additional cost! Only $249 – for all four hours, plus slides, handouts, more. Note on pricing: Unlike many people who discount as the event gets closer, we charge more. So I 100% guarantee that the best price you'll get is by registering right now! The price goes to $199 in September and $249 in October. So register now and save $100! I was very happy to contribute to Third Tier's Ransomware Prevention Kit fundraiser - even though I wasn't sure what exactly what they were raising money for. And of course the Ransomware Prevention Kit is excellent. Everything from Third Tier is. Then I got a note from Amy Babinchak asking me to post a short press release on August 1st. See below. The news was excellent. So I immediately asked Amy to do a short video interview that I can post up. Third Tier is very excited to announce a Women in IT scholarship fund. We are pleased to provide $10,000 to launch our scholarship fund. With this fund we will reimburse the exam fee for women who have successfully passed an IT or DEV certification exam. Exams fees are typically $150-$300. Why are we doing this? Third Tier is a woman owned business. I might not be here today, owning 3 IT businesses, if my aunt had not given me the money to take by first IT certification exam. This is my way of paying it forward. It shouldn’t be the case that woman only make up such a small percentage of professionals in this field. This is our small way of helping the women that are here get noticed. Established in 2008, Third Tier only works for IT Professionals by providing them with access to advanced support services. No one can know it all these days, so we give IT pros a place to go to get the hands on support they need in areas they normally don’t work in or problems they’ve never encountered. We also work on projects, fix their accounting practices and do many, many migrations and other installations. Our staff covers a wide range of technologies. Contact Amy Babinchak for more information. amy@thirdtier.net. Please support them with any donation you can!